SYLHET, Sept 12: Speakers at an event in Sylhet on Wednesday laid emphasis on strict enforcement of law to prevent air pollution across the country. Besides, they urged for enacting new act for ensuring quality air. Sylhet Divisional Commissioner Mesbah Uddin Chowdhury addressed the stakeholder workshop as the chief guest while Additional Divisional Commissioner Azam Khan chaired. About 50 academics, government officials, businesses and social activists took part in the workshop. BUET Assistant Professor Easir Arafat Khan presented the keynote paper. 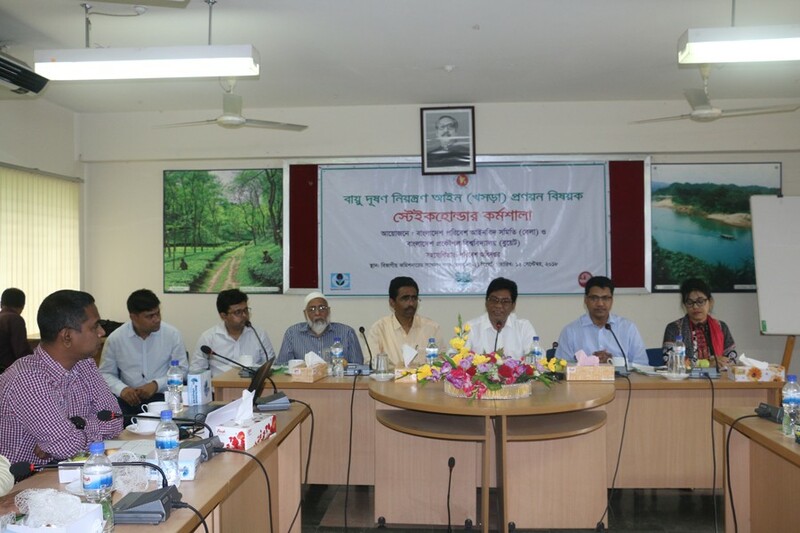 Professor ANM Mamun and consultant of the Clean Air and Sustainable Environment (CASE) project of the Environment Department Md Shahjahan spoke on the technical issues and need for enacting an appropriate law to ensure air quality. Deputy director of the Environment Department Md Alraf Hossain and regional coordinator of BELA Shah Shaheda Akhtar conducted the event. The event was told that eight air quality monitoring stations, including one at Sylhet city have already been set up on different regions. Referring a number of survey reports, the speakers said the situation is extremely unhealthy in cities like Dhaka, Gazipur and Narayanganj while it is comparatively better in Sylhet as yet. However, Sylhet situation goes unhealthy during the winter season. Besides setting dedicated zone for the stone crusher units could not be implemented yet even years after high court orders, the speakers noted. Sylhet region is one of the risky areas due to the various illegal interventions like illegal stone extraction and crusher units, they added. The speakers also stressed the need for enacting a draft act for sustaining clean air in Bangladesh as air pollution is getting worse day by day with unplanned and indiscriminate urbanization and expanding industrial units without considering environmental issues. The problems are multi dimensional, more complex and challenging, while direct receptor is extremely difficult, they said. The Sylhet region also has risk areas due to indiscriminate setting of stone crusher plants and others including unauthorised brick manufacturing units, coupled with destruction of natural forests. The event was also told such consultation workshops are being organsied at cities for stressing the need for enacting new law for ensuring clean air quality.